Download "SRL Networks Presents Hu'ewa" on the Skunk Radio Live Record Store. 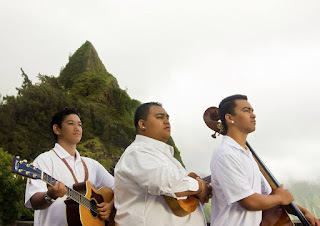 Comprised of Kekoa Kane, Kahi Young, and Kupu Dalire-Na`auao, these three young gentlemen from O`ahu are deeply connected to the hula world and music industry. As children or grandchildren of well-known parents/performers and kupuna (elders), they specifically chose their name, Hūʻewa, with the intention of carrying on the Hawaiian traditions in their own way, while continuing to honor all of those who have come before them. Listen out for Aluna I Ka Pali and other songs by Hu'ewa on SkunkRadio Live Instrumental Music programs.